Brand: CK Products 77-3320 Units: 1 5/8 oz. tube Candy coating in a tube makes painting molds, decorating cakes, cookies, and candies quick and easy. Melt carefully. They melt beautifully by simply placing them in a heating pad before using. Allow up to an hour for melting. You may also melt them in the microwave on the lowest setting for 20 second intervals, always kneading the plastic tube in between intervals. Melt until warm- not hot! *Note- if the candy is not coming out of the tip, simply use a pin to clean the tip. 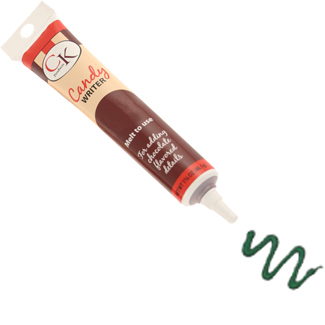 Candy coating in a tube makes painting molds, decorating cakes, cookies, and candies quick and easy. Melt carefully. They melt beautifully by simply placing them in a heating pad before using. Allow up to an hour for melting. You may also melt them in the microwave on the lowest setting for 20 second intervals, always kneading the plastic tube in between intervals. Melt until warm- not hot! *Note- if the candy is not coming out of the tip, simply use a pin to clean the tip. Ingredients: Sugar, Partially Hydrogenated Palm Kernel and Cottonseed Oils, Nonfat Dry Milk, Milk, Glyceryl Lacto Esters of Fatty Acids, FD and C Yellow 5 Lake, Soy Lecithin, Blue 1 Lake, Salt, Artificial Flavor.